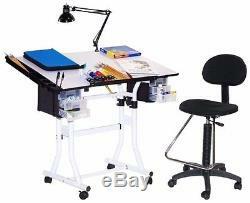 Set includes: Table, draft-height chair, clamp-on lamp, tray. Materials: Press board, steel, plastic, cloth, foam. Lamp requires one (1) 60-watt bulb (not included). Chair seat adjusts from 25 to 34 inches high. Table dimensions: 31-34 inches high x 40 inches wide x 24 inches deep. Chair dimensions: 41 inches high x 25 inches wide x 25 inches deep. Tray dimensions: 24 inches long x 2.75 inches wide. When returning an item, it must be in all of the original packaging and include all of the original accessories or items that came with it. The item and package should be in original and perfect condition. We do our best to process as quickly as possible. Trusty Commerce began with a vision of offering an outstanding shopping experience along with providing remarkable value. Our objective is to make it very easy to do business with us. We are continually adding new products on a daily basis and encourage you to visit us often. The item "Martin Universal Design White Drafting Table, Chair, Lamp And Tray Set" is in sale since Friday, February 24, 2017. This item is in the category "Crafts\Art Supplies\Drawing & Lettering Supplies\Other Drawing Supplies". The seller is "trustycommerce" and is located in Multiple Locations. This item can be shipped to United States.